KWST#2 started off with an absolute air of anticipation. I arrived early to make sure the venue was all set up and ready for the intrepid KWST’ers! KWST is an off shoot of LAWST and is unique in that everyone is able, likely and potentially willing to contribute through questioning or by giving an experience report. This year’s theme was Ethical Challenges for Testers and it promised to be an intense conference! 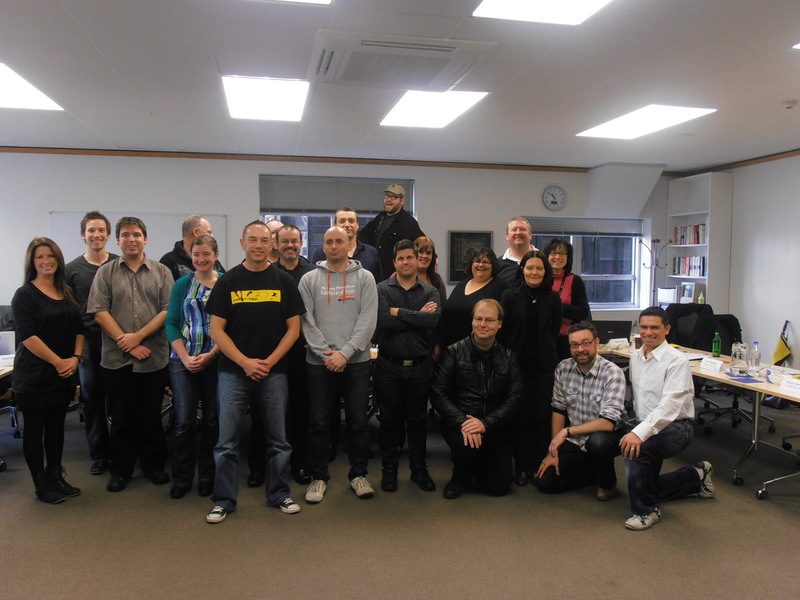 This year, 21 test leaders throughout New Zealand Australia were in invited. There was no magic formula, no *robust estimation tool* used, rather the attendees were invited on what they have done within the testing community (see www.hellotestworld.com or www.martialtester.wordpress.com ) or could achieve. In attendance were testers from vendors, consultancies, independents and various companies throughout the country. So…what happened? Once assembled, everyone *checked in* (a process whereby we explained where our head space is at and a chance to off load by announcing any distractions that may bother us that day) and James as content owner explained the process and the use of the coloured cards. Richard Robinson was lead off facilitator and I was supporting him. James led the way with his first ER and there were a number of questions (threads) which flowed from that. As is typical of a peer conference, the first ER tends to *flesh* out a lot of questions around the topic (in this case ethics) and was a good jumping point into KWST. Jeff Bidwell, Geoff Horne and Andrew Robins also gave experience reports on day one with varying degrees of success (i.e. the ability to give an experience report and defend their position). Reputation by attribution was something that James spoke about (and tweeted well by Oliver). Reputation needs to be defended as is your reputation by association. If for example, you are hired by a consultancy then that consultancy picks up your reputation as a tester and the tester may be tainted (whether it’s good or bad) reputation of that consultancy regardless of work done by the tester. It’s almost like reputation by diffusion. Counting test cases OR understanding and using meaningful metrics was a hotly debated topic. It was clear that the room was divided on counting test counts being ethical (of which the discussion itself was taken outside of the conference when it was agreed that we were heading down a rat hole). When is a tester ethically responsible for what he does? Make a clear distinction if you are a tool-tester or are directly responsible (tweet by Oliver) which followed a comment by James that a tool tester may not be responsible ethically because they are directed and told what to do. However, IF you are directly responsible for what work you do then yes, you have an ethical responsibility to produce good, meaningful testing for your client. Day one was like the start of a boxing match or sporting contest in which the *contestants* feel each other out, understand expectations and determine limits. Some didn’t like or understand the process or power of a peer conference. This power comes from the CONFERing – discussing, challenging, critiquing and attempting to understand a presenter’s point of view. The power comes from dialogue. The power comes from testers grappling with the assertions made and dissecting them. This is how a presenter’s reputation is won (or lost) at a peer conference. Day one was an opportunity to confer AND to network. KWST was about test leaders coming together. It’s not about business or certification or testing fallacies. Not all invitees will/have stepped up as leaders within the community BUT a number have…. James Bach (content owner), Richard Robinson (facilitator), Brian Osman (facilitator), Oliver Erlewein, Aaron Hodder, David Greenlees, Mike Talks, Katrina McNicholls, Liz Hutching, Katrina Edgar, Geoff Horne, Andrew Black, Farid Vaswani, Jeff Bidwell, Sheryl Toenders, Chris Stapleton, Donna Chin, Andrew Robins, John Lockhart and Mike Ward. Previous Previous post: Countdown – one week to KWST!